Tuesday market in September in the nearby walled mediaeval town of Fivizzano: Here are treasures of the past and future coming alive with movement on a special sunny day. It was time to record and celebrate. As we journey through life there are changes to our lives and to the world we live in. Because as an artist I have received so much from the beauty of nature and all that it offers, I need to put something back. "David is a great communicator." "A wonderful, inspiring experience." 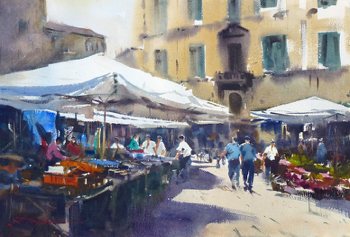 Moisture in the air, colour and atmosphere: every market day is alive in Fivizzano I can’t wait to see it again: it’s a piece of history for all time. 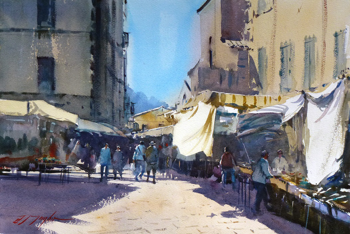 David is one of Australia's leading watercolourists and is renowned internationally for his painting and teaching. 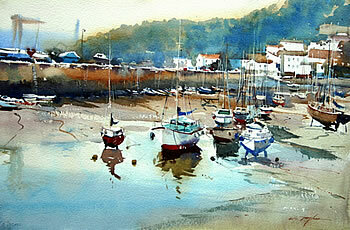 His work is in collections throughout the world and he has been featured countless times in art magazines. He served a six-year apprenticeship with a photo engraving firm as a colour etcher and engraver and he’s applied what he learned about colour and composition to his own watercolour work. David’s 40-year painting career has earned him more than 100 awards and his paintings are in collections all over the world. He’s held regular one-man exhibitions of his work since 1975. In each exhibition he expresses his love of working freely on location and his love of spontaneity, shape, light and colour. 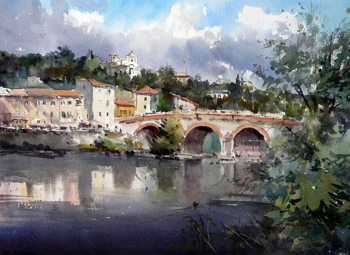 He is inspired by subjects that convey atmosphere, mood and feeling.